Congratulations to "Erin", the winner of Adrienne's JRS giveaway. Thank you to all who participated! We’ve all heard that saying, haven’t we? Even in the books we love, our heroes and heroines have friends. Whether those friends are mentors, business partners or childhood friends, they’re there to serve as a helping hand to our hero/heroine. In my books, those friends tend to be of the snarky variety. Maybe their love comes packed with a whole lot of toughness, but when the hero or heroine is in trouble, those friends always show up. No matter the time or place or situation. They show up. My author friends are the same way. We all try to help each other out. We also all love to connect with readers and chat about our favorite authors and books. Not too long ago my pals Nancy Naigle, Tracy March, Kelsey Browning, Tracey Devlyn and I decided to team up and create the Dangerous Darlings street team. What’s a street team? It’s a group of loyal readers who come together to help an author spread the word about their books. What could be better than hanging out with people who love books and want to develop a sense of community? And if we could make that community a place where there’s always something fun going on, even better. Our Dangerous Darlings motto is: Read. Reach Out. Repeat. As a reader, I love visiting blogs or author chats and interacting with my favorite authors. At a book signing once, I told Suzanne Brockmann that if anything happened to Jimmy Nash I’d be really upset. Really upset. She gave me a sly smile and told me to have faith. Thankfully, Jimmy turned out to be fine and I had a good laugh over informing one of my favorite authors she’d created a character I adored and she’d better not take him from me. As an author, this exchange with Suzanne taught me a lot about the kind of relationship I want with my readers. I want to joke and have fun with readers. I want to scare the daylights out of them every now and again and then (hopefully) make it all better. I’ll admit, the all-better part doesn’t happen every time, but most times it does. There’s gotta be some wiggle room on that all-better thing, right? That’s the fun of it. I killed off a much-loved secondary character once and a group of readers held a rally to save him. As mad at me as they were, it was a great compliment. My readers loved one of my characters so much that they stood up in protest when I offed him. I was impressed with their passion, but his fate had been sealed. I will always be grateful for the sense of community established over that one character. When my pals wanted to team up and create a street team, I thought about that incident with my readers and imagined what fun it would have been to chat on a dedicated Facebook page about it. A street team would let us connect with our most loyal readers. It would also let us reward them by offering swag and sneak peeks at covers and excerpts. We get to ask their opinions on character names and maybe have those suggested names wind up in books. As a reader, I enjoy that. As an author, I find it to be great fun. What about you? What are some of your favorite things about connecting with authors? I will be giving away a digital copy of THE CHASE to one lucky commenter, plus you have more options to win below! Could you use $50? Read on to find out how to win a $50 gift card of your choice (must be available for purchase online). Kelsey, Tracey, Nancy, Tracy and I have created a fun word scramble/scavenger hunt. Over the past two weeks, we’ve been chatting about Dangerous Darlings at the blogs mentioned below. We’d love to keep you updated on our new releases, contests and special appearance via our periodic e-newsletters. In addition to solving the word scramble, you could earn up to five additional chances to win the $50 gift card. All you have to do is sign up for our e-newsletters. One you enter the secret phrase in Rafflecopter, links to our five newsletters will appear. Each newsletter sign-up will get you that much closer to winning $50! 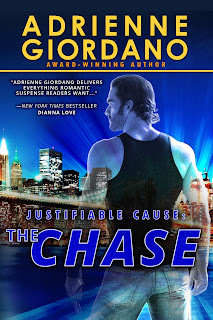 Bio: Adrienne Giordano writes romantic suspense and mystery. She is a Jersey girl at heart, but now lives in the Midwest with her workaholic husband, sports obsessed son and Buddy the Wheaten Terrorist (Terrier). She is a co-founder of Romance University blog and Lady Jane's Salon-Naperville, a reading series dedicated to romantic fiction. For more information on Adrienne's books please visit www.AdrienneGiordano.com. Adrienne can also be found on Facebook at http://www.facebook.com/AdrienneGiordanoAuthor and Twitter at http://twitter.com/AdriennGiordano. For information on Adrienne’s street team, Dangerous Darlings, go to http://www.facebook.com/groups/dangerousdarlings. I love finding out uow authors come up with ideas and finding out what is next. Would love to win. Hi, LS. Thanks for stopping by. We have a ton of fun chatting with the "Darlings". They're a great bunch! I know authors don't always seem themselves as celebrities, but I see you guys like that, so anytime I receive an email or tweet or facebook reply to something I am excited and a little starstruck. And yes, I have name dropped authors a time or two around my friends and pretended we were bff's. Okay, maybe not that bff's, but I do like opening up a conversation with, "I have this author friend I met online" and instantly people that don't read are like, "Really? They reply to you?" And when I got to do my first beta read or mentioned in an acknowledgement I was over the moon. All because I just started out by thanking an author for writing a book I enjoyed. It is awesome. So, to be a part of a street team where I get to interact with authors that I love to read is so incredibly awesome. Congrats on the street team success and on all your books, Adrienne! Hi, Amy. I'll share a little secret with you. When we first started talking about doing the street team, I used you as an example of the kind of person who would be perfect for a street team. I love how excited you get about books you love. As an author, talking about my characters is fun and readers like you give me the opportunity to do that. Plus, we get to bounce ideas off of you and get your opinion from a reader perspective. For me, that's invaluable. So, thank you for your dedication. You're a gem! I'm so loving this street team. It's fabulous to have an ongoing dialogue with our Darlings (like Amy up there :-)). You know I loved The Chase and can't wait to get my hands on the next novella. And I completely agree about having an ongoing dialogue with our Darlings. They're such fun! I love sharing information with other readers about the great books I read. And getting to know the authors behind the words just increases the reading experience. Plus, it's lots of fun. Hi, Brenda. I think social media has really helped to open the lines of communication between authors and readers. It's a great tool for "chatting" with favorite authors. I get a thrill when some of my favorite authors respond to tweets I've retweeted for them. Harlan Coben thanked me on Twitter one day and I had a total fan girl moment. LOL. Congrats on the release of The Chase! Really looking forward to reading it. (Yes, I have it on my TBR pile already!) Naturally, I love the name of your street team as I have a clear fondness for the word "dangerous." LOL. Love your Brockmann story! Suz is the best! Here's to many sales! Hello to my friend Dee J! Thanks for popping by. Yes, you do have a fondness for the word Dangerous. LOL. I'll never forget that Suz story. She was such fun to chat with and a terrific example of how an author should treat their readers. Love her books! I love blogs... getting the chance to learn about authors and their books... getting background info on how characters and books come to life... showing us that authors are everyday people too... Last Summer, was the very first time I actually went to a convention and came face to face with authors... it was beyond anything I could have imagined... I was extremely nervous... but I am a shy one anyway, but it was an experience that will stay with me... it was great! Hi, Colleen. Author conventions are such fun. It's a great opportunity to meet authors and make new friends. I always look forward to the RWA conference. It gives me a chance to catch up with my pals and talk about books. Hi, Tracy. Thank you! I had so much fun with Gabe and Jo. They're meant for each other. I'm not sure anyone else could handle them. LOL. Hi, Erin. I have a running joke about talking to imaginary people for a living. It's true though. I always have some kind of dialogue running through my brain. Typically, my early drafts of books are all dialogue because I have to get it all on paper before I forget. PS: I'm having trouble posting so if three messages suddenly show up, forgive me! Hi, Jenna. Nope. Only one message. :) Thank you for coming by and for the well wishes. We're having great fun.